Montessori Candy: MONTESSORI PRINT SHOP HUGE GIVEAWAY! MONTESSORI PRINT SHOP HUGE GIVEAWAY! It's time for the BIG announcement! Another giveaway! Montessori Print Shop is having a wonderfully huge giveaway starting today, October 15, 2010 and going until Friday, October 22, 2010. What's the giveaway? A Deluxe CD Rom Collection- 2 Disk Edition filled with every single item listed in their store! To put it in perspective, this is a giveaway worth over $580.00!!! Montessori Print Shop has added 4 additional prizes! All additional prizes are online coupons to be used at Montessori Print Shop and will be valid for 1 year. I've been ordering Montessori printables from them for the longest time now. What I love is that they have so much quality material to choose from, and not only that, but the files are super affordable and quick and easy to download! One of my favorite things about Montessori Print Shop is that I can buy items " a la carte", and of course their prompt and attentive customer service has been so helpful to me in the past. 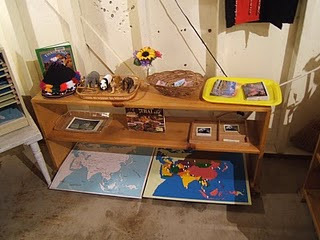 Montessori Print Shop's Geography materials are a MUST in my book! They help to create such a well rounded presentation of both physical and cultural geography. 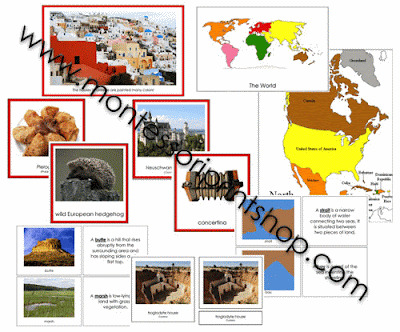 If you are putting together a continent kit or focusing on a particular continent, Montessori Print Shop has some wonderful items for inclusion. Not only are their continent geography items color coded, but they also include such categories as food, music, landmarks, and animals! My husband and I are so impressed by how these materials have made geography come alive to our children! Before son #4 had even turned 4 years old, he was remembering that Panda's are from Asia and specifically China! It is also amazing to me how these materials have sparked such a multicultural interest in my children. They are so excited to try new foods and learn about different cultures! I just love Montessori Print Shop's Language items! Using their Phonics 1,2,3 guide makes it easy for you to shop and choose the items that best fit your child's level! DETAILS FOR ENTERING THE GIVEAWAY! You must have a Canadian or US Shipping address. One entry will be given to each person who goes to their online store at www.montessoriprintshop.com and then back to Montessori Print Shop's Blog post and leaves a comment saying what their favorite item is and why. A Second entry will be given to each person who writes a blog post mentioning the Deluxe CD Rom Giveaway. You must leave a separate comment on the Montessori Print Shop post and provide the link to where the giveaway is mentioned on your blog in order to receive a second entry. A Third and Fourth Entry will be given to each person who includes the Montessori Print Shop blog on their Blog Roll. You must leave a separate comment on this post and provide the link to your blog in order to receive a third and fourth entry. 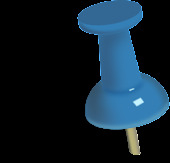 Montessori Print Shop and Montessori Candy reserve the right to delete any comments, or links that are deemed inappropriate or offensive. Entries will be chosen at random (using random.org) and must include an email address which will be used to contact you in regards to the prize and also for possible inclusion in future newsletters. The winner will be mentioned on the Montessori Print Shop blog (first name, last initial, and province/state of residence only). Double your chances of winning by leaving a comment here at MontessoriCandy.com (must be on this post), and enter Montessori Print Shop's Materials Giveaway through my site as well for an increased chance to win! To view photos of all 803 Montessori Materials on this CD Rom visit the Montessori Print Shop Store . Wow, amazing giveaway from Montessori Print Shop. I have just started on my Montessori journey and am looking forward to using their materials. I am just starting on the continent boxes and am going to incorporate their Geography collection. I am so excited that they have French resources. I will be ordering some soon as we teach French as a second language in our home. I would love to win the Montessori Print Shop CD-rom giveaway. I am a new Montessori teacher at a small but growing school and would really benefit from this. I love all of the Montessori Print shop materials, especially the geography folders. I had actually recently mentioned them in a post on my blog. I added Montessori Print Shop to my blogroll. What a great resource, I'm so glad you posted it! Lots of fantastic information. I'm just beginning to teach my three year old son with Montessori materials, so this giveaway would be awesome! I really like their picture cards - so colorful and realistic! I have to agree with Rebecca ... I am also drooling over this giveaway. I hope that I am lucky enough to win this one!!! I have been checking out the Language Series and I just now found the calendar tags, pre-writing sheets, and pin poking practice sheets. They are great! I can't wait to see if Spanish and Sign Language materials will be available soon (unless I somehow missed them in one of my late night viewings). My daughter is obsessed with learning. Thank you for this opportunity, Tracey M.
I love the Moveable Alphabet set. print on cardstock and laminate for a durable, cheap, portable set for at home. The CD would be a great benefit for other parents at my son's school. Linked back on my Facebook page! following your blog...so much good stuff. Wow, that looks like a fantastic resource. I have been using materials from Montessori Print shop for the past year. I love how affordable they are and how beautiful as well. This CD-ROM giveaway would be a huge asset for my classroom!!! What an amazing giveaway! I'd be so blessed to win! I entered the contest on their blog and am leaving a comment here for another entry! The French resources are my favorite! How generous of Print Shop. The materials look incredible. I just found the site earlier this week, affordable prices as well! Thank you for a chance to win! I went over to MPS website and I think Moveable Alphabet with Lesson Instructions will be a hit in my "classroom". Thank you fo doing this. I soooo want to win. What awesome resources. They would really help me get back to doing Mont with my kids. I just recently found Montessori Print Shop and love all their items. They have made teaching Montessori in my home super easy! These are great, a LOT less expensive than buying Doman books on Encyclopedic Knowledge or making up hundreds of "bits" by yourself! I'm very impressed with the CD-Roms! Yours seems a good site I shall subscribe to. I would LOVE a chance at this. THey have such wonderful things to choose from! The language , French materials definitely a great help. Thank you for entering my name in your giveaway contest. I'd love to use their toddler cards and language resources! I have been homeschooling for 6 years and this will be the first year I am going to use Montessori materials. I have 6 children ranging from 6 months - 12 years! I am very excited to try and win this wonderful CD. The children are very interested in the lessons I have brought in for them. Although new to this website, I am telling everyone I know about the wonderful materials available. What a great way to help our young ones. Thanks. All these materials are great! I would love to win this giveaway and have access to all the resources!!! I'm so excited about the Montessori Print Shop's CD-ROM Giveaway.I'm a stay-at-home mom, so am very budget conscious. 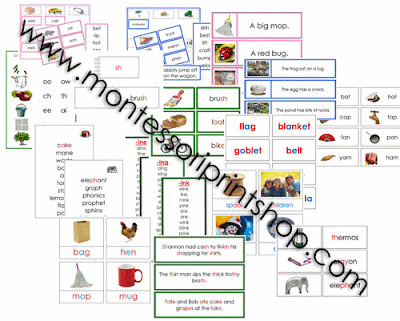 Montessori Print Shop provide cheap and high quality materials. I love the nomenclature books and cards. I even double the nomenclature cards as flash cards. So it's killing two birds with one stone. This help me to save time. I have 3 kids so any extra time I can spend with them is great. Although I stay in Singapore, I asked a favor from a friend who is staying in US for help. So that I can have a chance to win this GREAT giveaway. I would just DIE if I won this giveaway! Ever since I found that site I've been lusting after just about everything they have! My 4 year old right now is loving the pink phonics cards. I'd really like to get the continent kits as soon as I can afford them. Wow!!! What an amazing giveaway!! I can barely believe it. I would love to win. Thanks for organizing such a huge prize. I have been impressed with Montessori Print Shop. Professional materials, wide variety, and such quick turnaround. I have my fingers crossed! I am crossing my fingers! Thank you! Thanks for this great giveaway! I love the 3 part Art cards. The pictures are amazing! I really like the geography material I bought from them, and want to own more of the language material. Fingers crossed. I'm a fan of Montessori Print Shop and have been saving my pennies to buy their collection. I'll write my blog post tonight and link back! I love how Montessori Print Shop utilizes such beautiful (and real!) photos for many of their three-part cards, instead of the standard line drawing. I much prefer their photo land and water form three-part cards to the standard outline ones! Would love a chance to win this AMAZING giveaway. I love the montessori sensorial materials! They are a great tool for fun cognitive learning! ;) Thanks for this wonderful giveaway! I have and love the movable alphabet, the sensorial cards look extremely useful too, thanks! I am so excited to hear about this fantastic giveaway at Montessori Print Shop. Their photos and information provided are beautiful and helpful....satisfying the curiousity of preschoolers and kindergarten students in my classes. Thank you for providing a site I can trust for factual and complete data....you rock!! this is an amaaaazing giveaway. I like the Anatomy and Zoology nomenclature cards. Thanks for this generous giveaway! My son is on the verge of reading so I really like the entire phonics series. Please enter me for the giveaway. The CD-Rom give away by Montessori Print Shop is awesome! We use Montessori Print Shop materials in our primary and elementary classrooms. The pictures are high quality. Being a small school, a prize like this would be amazing!!! I am new homeschooling Montessori mom and it would be fantastic if I won! Thanks! Just want to let you know that there are also daddies who are using Montessori with their kids. :) We like all their science and geography materials. There are so many great things here. This is a totally new world to me. The geography stuff all looks so wonderful as does the zoology items. Not so sure I can pick one favorite! My family would be blest to receive this gift. What a fantastic set of resources they have on offer. Their materials are so vivid and appealing. I've used their materials a number of times. It would be SO amazing to win their giveaway! i love the african animals cards and geography materials! oh, how i would love to win this giveaway! My son is crazy about cars and planes so we love all the transportation nomenclature cards! My sister-in-law told me about this giveaway. We all love Montessori! We homeschool our kids so this would be a great way to expand our Montessori materials. Thanks! I am entering this giveaway to try and win the CDs for my niece who loves learning the Montessori way! I am also teaching her French so we love it that their site has French materials! Amazing giveaway! Please count me in too! My son used to attend a Montessori preschool but does not anymore due to unforeseen circumstances so I try to provide a similar environment in our home as much as possible. I love everything in the print shop but like the Math materials the best! Thanks for this giveaway! I would love to have all your materials for my son Dylan but I think I like your geography and culture cards the best!